General Hospital (GH) spoilers for the week of November 13 tease a confrontation. 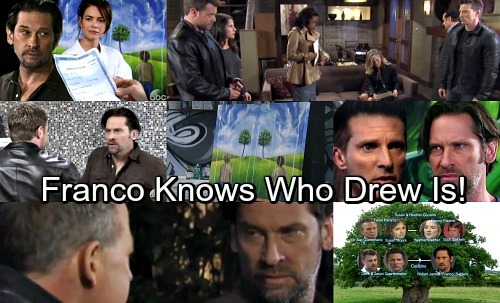 Franco (Roger Howarth) will be questioned about what he knows regarding the Jason twin issue. Franco does admit something to Jason Morgan (Billy Miller) and Patient 6 (Steve Burton). However, he keeps one important piece of information to himself in his typical Franco deceptive manner. Jason, Patient 6, Jordan (Vinessa Antoine) and Sam (Kelly Monaco) will confront Franco at Elizabeth’s (Rebecca Herbst) house. They demand answers, so Franco gives them what they want… just not all the details. Franco explains that Andrew’s death certificate might not be real. He also suggests that one of them is Jason, while the other could be Drew. Of course, they are shocked by the revelation. General Hospital spoilers reveal Jason and Patient 6 aren’t going to take Franco’s word for it. They need to know if it’s possible and demand proof. GH spoilers tease that one crucial piece of information will be kept from them. Franco doesn’t share who he believes is Jason and which one is Drew – but he feels he knows the truth! Yes, Franco is convinced he knows which one of SB Jason and BM Jason is the real deal and which is Drew. As fans suspect, the reason is because of Liz. When Patient 6 showed up in Port Charles, Franco feared losing the woman he loves. He is starting to panic and unravel a bit as is his habit when under pressure. However, that isn’t his only motivation for keeping the twin identity tidbit to himself. 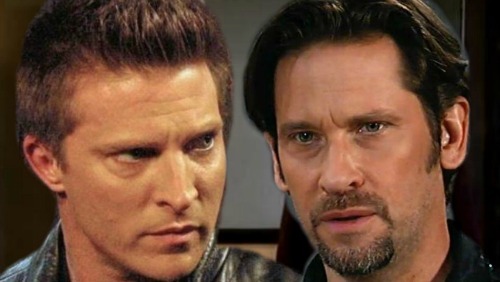 General Hospital spoilers reveal the other reason is due to his volatile history with Jason Morgan. With Billy Miller’s Jason, the two men were able to keep things somewhat civil. In Franco’s mind, if Patient 6 is the real Jason, things could get hostile again – after all, look at what happened to Franco when SB Jason saw him at the hospital! Co-head writer Shelly Altman explained that Patient 6 didn’t have five years of “peacefully coexisting” with Franco. Therefore, Franco believes that Steve Burton’s character will want him dead and you can’t really blame him for thinking that. Since Franco didn’t share the most important detail of which twin is Drew and which is Jason, BM Jason and Patient 6 leave wondering the same thing. Both want to prove that the other man is Drew, and they are the real Jason. Each wants to claim their name and restore their lives. However, GH spoilers hint that it won’t be simple. The people of Port Charles are already taking sides – so are GH fans. Everyone wants answers right away, and some are convinced they already know. However, the storyline is a nine-month arc. That means there will be a lot of shocking twists and unexpected turns before the mystery is solved. 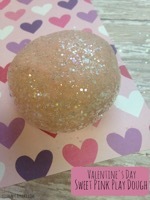 Good soap is not only about the end result, it’s largely about how we get there, and GH is GREAT soap! Keep watching the ABC soap and check back with CDL for the latest General Hospital spoilers, updates and news.